McKinsey recently published a feature on digital personalisation. 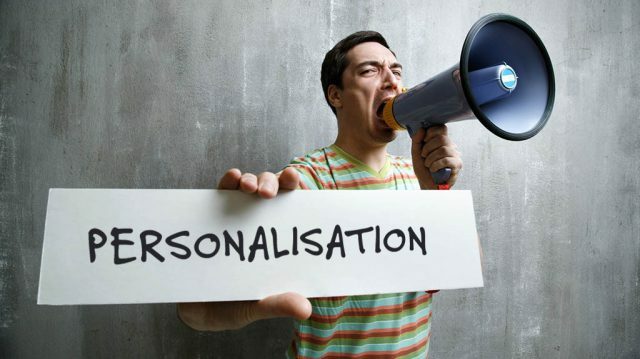 It summises that personalisation is about providing relevant information that satisfies a customer quickly. If you use digital tools to make a customer feel exclusive, you have an open opportunity to increase engagement and loyalty. So, digital personalisation is about creating relevant online messages about your services that are based on customer experience and their online search behaviour. But how can digital personalisation benefit you as a business and your customers? According to McKinsey, the key challenge is to transform your business processes to achieve the full potential of personalisation. Quite simply by remembering and presenting relevant offers to customers will increase conversions and win more customers. 1. Behavioural data – personalisation is rooted in acting on customer behavioural data, so group customers by similar behaviour and needs and segment them according to your service offer – customers rapidly get frustrated when they are fed content has nothing to do with them. 2. Customer journey – unpack the series of interacations with your brand from the customer’s initial information gathering to purchase and use; this data can be powerful if integrated from your website, instore purchases or phone enquiries. 3. Customer signals – be in tune with your target customer activities by monitoring their purchases, online browsing, and even social media posts, your brand in turn should respond to these signals with a relevant, timely message or ‘trigger’ – trigger messages must dynamically match the customer signals. 4. Messages – customers can decide in a matter of seconds if a trigger message is relevant, trigger types include images, copy, headline titles and offers that directly relate to their behaviour, this must be monitored and refined to capture its full value. 5. Dedicated teams – empower a team to search and identify for target customer signals that have the highest potential value and develop iterations of both personalised and localised messages that achieve results. 6. Respond quickly – encourage your team to revise copy, produce inspired content that can be mixed and matched to create a number of personalised variations to help deliver triggers more efficiently. 7. Conversion – if you need a good reason to invest personalisation, it can drive conversions, and increase sales for use of pre-filled purchase forms, offering relevant deals saving them time hunting for them or even pre-loaded landing pages with bespoke customer information. 8. Cost efficiencies – MicKinsey maintains personalisation can reduce customer acquisition costs by as much as 50 percent and lift revenues by 5 to 15 percent. 9. Relationship building – personalisation can allow you to develop meaningful relationship with your customers that become special by gathering more and more data on their habits and preferences to make it feel truly personal. 10. Wider campaigns – email campaigns can benefit from personalised messages which focus on quality, rather than quantity, this in turn can help reap better open and click rates than content stuffed one-size fits all emails. In summary, digital personalisation can help improve your marketing efforts, it can help marketing become more predictive and position what the customer wants before they even request it. alexandrapatrick provides original, cost-effective strategic marketing services in Kent, UK. alexandrapatrick has particular experience and expertise in digital marketing, copywriting, public relations, location/destination marketing, healthcare marketing and marketing consultancy. If you’d like to find out more about how we could help introduce digital personalisation to support your business, email info@alexandrapatrick.co.uk or contact via Twitter. This entry was posted in alexandrapatrick, Digital Marketing, Marketing Campaigns and tagged alexandrapatrick, digital marketing campaign, Digital Personalisation, McKinsey. Bookmark the permalink.